HOT BRUTAL CONDITIONS WERE CONFRONTING ALL GRADES IN THE CLUB CHAMPIONSHIPS HELD AT BRAMSTON BEACH ON SUNDAY. The A Grade had to contend with an extra 30 odd kilometres by going out to Mirriwinni twice making the race a tick under 100 klms, and this took its toll on three of the clubs strongest riders. Obviously the weather bureau played its part with only five making the trip down to the picturesque Village. However this didn’t detract from Kieran Mouldey, Luke Azzorpardi, Thomas Beddome, Tobia Kipper and Belgium Holiday maker Gaetan Marion setting a sizzling pace as they set sail for the Garradunga Turn off. The first surprise of the race occurred on the first lap when the support vehicle following the large C Grade group noticed Kieran Mouldey over 100 metres clear of Beddome and Marion, with a huge space to Azzopardi and Kipper as the small field merged back on the road to Mirriwinni. Sensing maybe a mechanical for both Riders, the Author noticed Luke’s Shirt unbuttoned in the front suggesting that the Star Teenager was doing it tough and Ditto to the usually ULTRA consistent Tobia. So early in the race it appeared that Beddome, Marion and Mouldey had the race to themselves, this was confirmed later when Azzopardi and Kipper were riding at the back of B Grade. So 5 became 3 but despite a strong effort from Mouldey on the second run out to the Small Bruce Highway Town, Kieran slowly dropped off the back losing contact with the two leaders. Both Thomas Beddome and Gaetan Marion were completely on their own, both sitting on 40 odd klms per hour both appearing to relish the rolling hills as the pair hit the flat section toward Mirriwinni with the gap ever increasing back to Kieran Mouldey. Both riders looking comfortable turned for the final run back to Bramston rolling turn after rolling turn. However about 4 Klms back toward the Beach well prior the hills, Marion upped the ante, maybe wanting to dislodge the South Australian before Thomas a noted climber reached the inclines. So Marion quickly put 20 metres on Beddome who at that time had no answer. From that point onwards the Talented Marion who had pushed local Champ Bart Duraj in a recent Criterium, kept increasing his lead, and he was around two and a half minutes clear of Beddome past the Judges area heading for the river, and that Margin blew out to about three and a half minutes by the time Gaetan Marion Hands in air saluted the Judge. A fantastic ride by Gaetan for his last appearance with the club before he heads on his riding Holiday to our good neighbours in Townsville. A huge wrap to Thomas Beddome who also put in a magnificent effort in finishing second, returning toward the form that saw the South Aussie rider take honours earlier in the year on the Southern Tablelands. Kieran Mouldey may have taken the club Championship if he could have continued on to the final few Klms because Gaetan and Thomas riding on permits aren’t members of the Club. However at the pace Kieran went out in the early stages it was no surprise he opted for the showers, it was a brave effort from the affable Mouldey. Again as in the A’s a small but very even field with evergreen Grahame Allen taking on (Have bike will travel journeyman) Tom Cook, Plus recent Newcomers in Vince Marcel and Michael Keetman. Add the very in form Brian Nesbit plus a huge welcome back to Neil Gregory who has been absent from the road for some time. This race had all riders pretty much together through the early stages. However Michael Keetman bravely picking this race for his road debut with club, having had good success on the track, found the pace and the heat a little strong and headed for the ice bucket. The remaining Five all doing their share were very evenly matched, although it was very noticeable that Vince Marcel was very adept through the hills therefore having all riders watchful in case Vince should try and steal a march, although that would be difficult in such a small and even bunch. Each breakaway attempt mainly by Marcel and to a lesser extent Allen was continually clawed back by Cook, Gregory and Nesbit. This was scene throughout much of the testing course from the Beach out to Mirriwinni via the Garradunga road and Back, however heading past the Judges box heading for the river any of the five could still win with Brian Nesbit and Vince Marcel now starting to assert some authority over the others with Marcel leading strongly being chased by Nesbit then Allen, Cook and Gregory not far off them. Up the first rise to the river Marcel was startled by a non-official official or a bloke stepping out from a gravel road with a sign saying beware a cattle truck could be emerging, not knowing what was going on Marcel steadied losing some ground and in turn was grabbed by Nesbit on the river turn. Then Brian Nesbit continuing his outstanding form, started edging clear and took the race with 8 seconds to spare from Vince Marcel who refused to use the gravel road incident as an excuse, and Vince had 15 seconds over the third placegetter Tom Cook with Neil Gregory and Grahame Allen next in registering similar times crossing the line. All five riders doing a Stirling job considering the conditions. Shorter race out to Mirriwinni and back, 16 started 16 finished one heck of an effort under the stifling conditions. Prominent out of the beach and straight into hills were Gavin Butler, Idan Piercy, Steve Davies and Keith Fearon although all 16 were pretty compact and we had an interesting race on our hands as the large field swept past the Russell River. Over the difficult railway lines Fred Boin was close to the top and Ditto Russell Eustace although the Commissaire did give a tut tut over the length of Russell’s socks (yes the length of, being a new rule). Just passed the half way to Mirriwinni and the sixteen were stretched out in single file indicating a solid speed, with Andy Mills now on top of the speed with Idan Piercy and Mick Mehonoshen. Turning at the Village Jack McKinstry never far of the pace was looking strong and Thomas Rue along with Steve Davies were riding strongly, and there were plenty just chasing them with plenty to offer, including Gavin Butler, Mark Procter, Scott Carson and Chris Chastre. Very noticeable slightly better than midfield was Gerard Walsh with similar looks to former Champion Surfer Midget Farrelly with the golden locks flowing out the back of his helmet, and on a day like today many in the race would have thought that a crack at the waves might be a better option. The lead was changing regularly and approaching the railway crossing on the return trip, The super aggressive Gav Butler sensing caution by most made a quick break and shot clear ONLY TO BE PICKED UP QUICKLY by Boin, Davies and Fearon. Back into the hills and Butler again led Davies, Piercy and Fearon with McKinstry riding comfortably tucked in behind them, however there was a great mob in close attendance as they shot passed Graham Range Turnoff with Jason Whiteside, Nick Masasso, Mick Mehonoshen and Russell Eustace only 20 odd metres off the leading pack in the last four places. Passed Smoko and the taunting Butler held sway until joined this time by Piercy, Fearon and McKinstry with Scotty Carson moving into the picture. Swinging onto the Esplanade and passed the judges, Walsh was making a bold but short lived bid with McKinstry poised to pounce along with Chastre, Carson, Boin and Mills. Into the hills heading for the river Keith Fearon appeared to drop a chain putting paid to any chance he may have had and Nick Masasso was just losing touch. Turn at the river and there he was again Butler turning in front of Boin, McKinstry, Chastre and Mills however sneaking closer was BOOM Sprinter Thomas Rue, all riders in front knew they had to drop Rue on the hilly return to be able to keep him at bay. So Butler had a crack totally splitting the field with Davies, Walsh and Whiteside in instant trouble. The move from Butler worked because although Gavin had now nothing left to give Mc Kinstry, Chastre and Boin had grabbed a200 metre break on the danger man Rue. Hills gone and the run in. Here I will quote the words of Chris Chastre. (“Back on the flat run in, I thought McKinstry and I had the race, until I heard the ROAR of Carbon Wheels behind us whoomph whoomph I knew who it was and Thomas grabbed us 200 out, Boy can he sprint ) and sprint he did powerfully finishing right over the top of young university rider Jack McKinstry who had just got the better of Chris Chastre with Scott Carson finishing strongly into Fourth spot just in advance of Fred Boin and Mick Mehonosen in the race of the Championships. Very pleasing to see a field of ten line up in the D and W event, in particular the three women braving the challenging conditions on their 50 odd kilometre journey From the Beach to Mirriwinni and back. Kylie Anderson, Danielle Charles and Terry Sullivan would mix it with the men as the club strives to include a standalone Women’s race in the near future. So it was two races in one when Richie Bates sent them on their trip. It didn’t take long for first incident, when wily veteran Jeff Hartley punctured before reaching Smoko Creek. It was bad luck for Jeff as the septuagenarian is starting to prepare for his next year’s Masters events. Cleverly Danielle Charles and Terry Sullivan weren’t prepared to match it with hot speed set by Gary Perkins and Newcomer Devan Van Vliet. Danielle and Terry were comfortable to work together at the back intent on survival and gathering experience on these initial ventures. On the other hand Kylie Anderson was sitting in the middle of the bunch passing Smoko. Devan Van Vliet in only his second ride with the club was particularly prominent throughout the race as was Jon Pearce and Todd Hartley who led the field at the Turnaround. Michael Etherington the Criterium King was sticking close however the road is not quite his favourite event, right with Michael was Nigel Hales and Kylie Anderson. At this point back from a serious shoulder injury Track Specialist Gary Perkins was understandably feeling the pinch and it was great to have The COURT JESTER back on his bike. 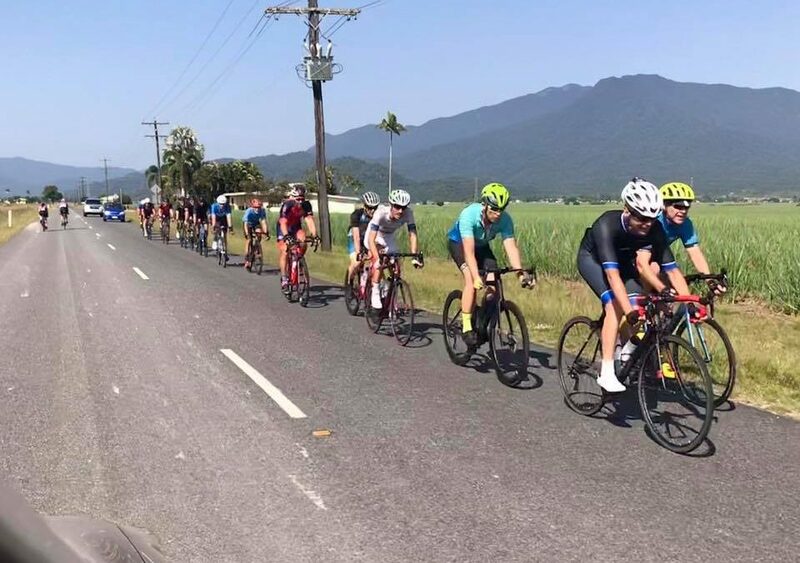 Behind that pack were Danielle and Terry riding with total control both looking strong and seemly enjoying their first road race in Cassowary country. Basically the top six riders mention at the turnaround controlled the tempo right to the run to the RIVER and this stretch is where the races will always change complexion. Devon Van Vliet, Todd Hartley and Jon Pearce were the favourites as they disappeared into the hills. Back in sight on the flat for the run in, the race was now between Van Vliet and Hartley as they had pinched a few seconds on Pearce over the last rise and it was the lanky Devan Van Vliet crossing the line 6 seconds in front of Todd Hartley, with another 26 seconds back to Jon Pearce and Michael Etherington with Nigel Hales just in front of Kylie Anderson putting up a terrific performance to stay with the field throughout the race. The race didn’t end there as Danielle Charles and Terry Sullivan entered the last stage having ridden to that point a tactically superb road Race pacing themselves for podium finishes. As Mentioned in the B grade THE CATTLE TRUCK official this time waved Danielle and Terry down, with an understandably confused Terry thinking he may be a Cycling Official AND WAS diverting them onto the gravel road where Terry came to grief (minor Gravel rash thank Heavens.) In fact the man was concerned a fully laden Cattle truck was about to enter the course, and could cause mayhem. Fortunately when the truck entered the road all was clear but not before Terry had come to an abrupt halt. The Outcome was Danielle officially finished second with Terry third behind Kylie Anderson who took the honours and is the club Champ. It was great to have Kylie, Terry and Danielle compete on the road and all three will continue to support women in Cycling.